By 1850 America had developed at a whirlwind rate. A proposal to construct a railroad to the Pacific Ocean was being discussed in Washington, the gold rush of a year earlier had planted the seeds of development from coast to coast, and in New York the banking industry was exploding. 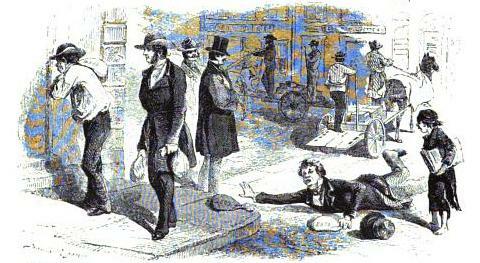 In the four years between 1849 and 1853 the number of banks in the city more than doubled—from 24 to 57. Porters rushed along the streets with bags of coins, exchanged at other banks for checks. A formalized procedure for settlements and accounting was non-existent. In 1853 George D. Lyman set forth his suggestion that banks send and receive checks at a central location, and the idea took root. 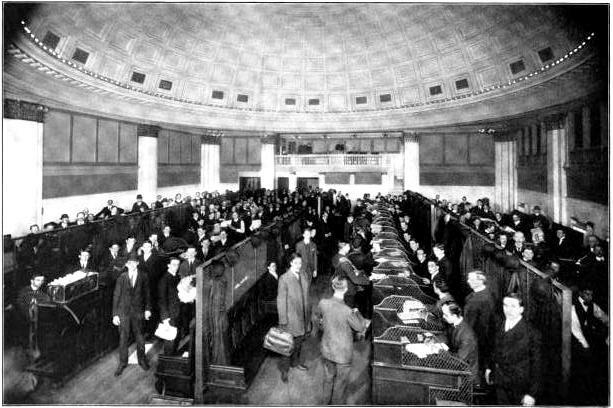 On October 11 that year the New York Central Clearing House opened in the basement of No. 14 Wall Street with 52 of the 57 banks participating. The tangled knot of exchanges among banks had been unraveled. In 1858 it moved to the fourth floor, later adding he fifth as well. 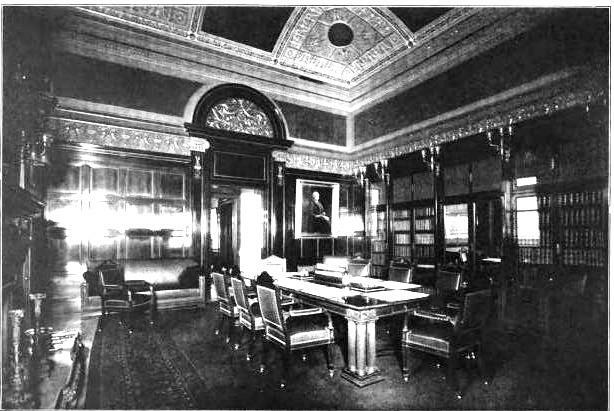 At a meeting of the association on December 29, 1893 it was agreed to acquire the property at Nos. 77-83 Cedar Street, between the National Bank of Commerce and the American Exchange National Bank. 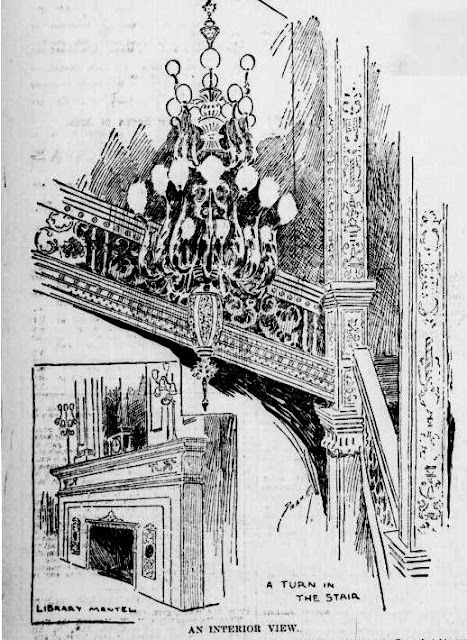 Just over two weeks later on January 17, 1894, the building committee released a hint of what was to come. The idea of foregoing a “pretentious exterior” lasted approximately three months. Seven architects submitted plans for the New York Clearing House building and after several weeks of discussion, the design of Robert W. Gibson was selected on April 21, 1894. 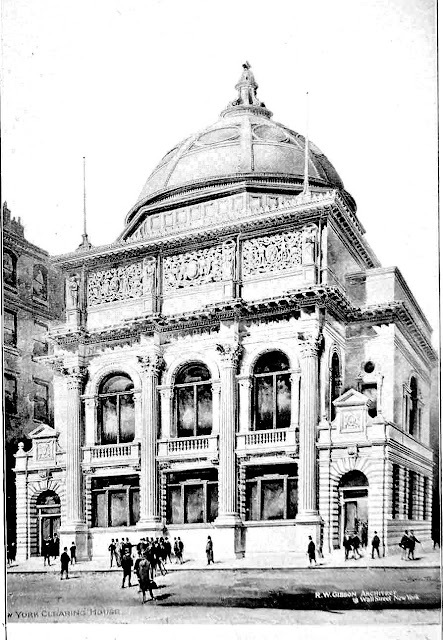 The English-born architect was already responsible for several notable Manhattan structures including St. Michael’s Episcopal Church and the striking West End Collegiate Church, both on the Upper West Side, the United States Trust Company, the Botanical Museum at the New York Botanical Garden, and the Fifth Avenue Bank. The splendor of the exterior was matched inside. There were marble halls and grand staircases. 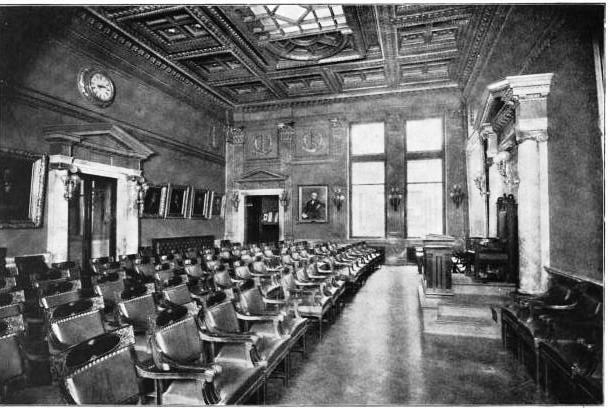 On the second floor were a library, board room and committee room. The piece de resistance was the “great exchange or clearing room” on the third floor. The central section of the room was 60 feet square, with two wings that brought the full length to 80 feet. “The ceiling is a dome rising 25 feet above the walls. It is paneled in fire-proof stuff in Renaissance style, and the walls have pilasters of a Corinthian order supporting the cornice and dome…The room is lighted by a great iron and glass skylight, which forms the upper part of the dome,” reported The New York Times. 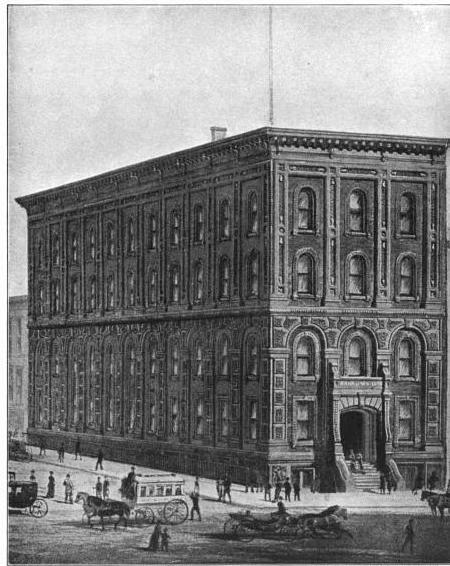 The Chase National Bank had shared the old Pine Street building with the Clearing House and it moved into the Cedar Street headquarters, as well, as the only tenant. That crisis was followed immediately by another—World War II. 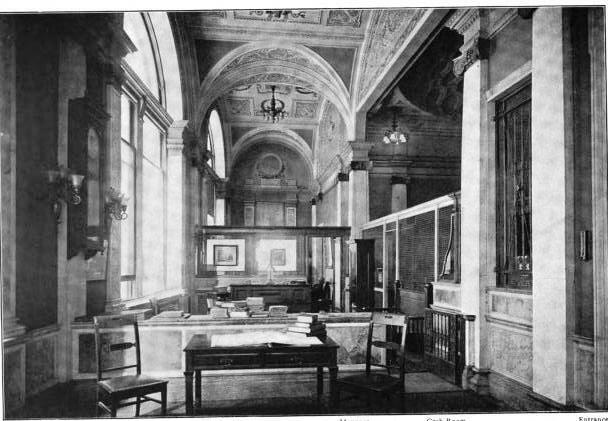 Although the war precipitated what New York State Superintendant of banks called the need for “greater sacrifices by banks” and the necessity of issuing “ration coupon banking checks,” it also was seen as the way out of the Depression. Just after the end of the war the New York Clearing House faced yet another problem: counterfeiters. Their greatest antagonist at this time was Alexander D. L. Thiel, described by the Clearing House as “one of the cleverest professional forgers of this generation.” By the time Thiel was nabbed by two New York detectives Lieutenant Grover C. Brown and Detective Archibald J. Woods in 1946, he had cost banks “close to $500,000.” In an unprecedented display of appreciation, the New York Clearing House Association presented “illuminated scrolls” to the two men in a ceremony on August 25 that year. The financial recovery of the nation was evidenced that year when check clearings through the New York Clearing House Association amounted to nearly $365 billion—the highest level since 1930. 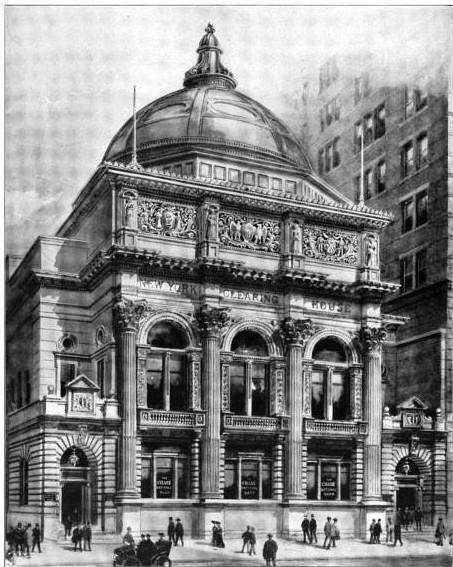 In the spring of 1963 the Clearing House Association abandoned its Temple to Finance and moved to new headquarters at No. 100 Broad Street. Two stories tall, the $1.5 million structure was designed by Rogers & Butler. 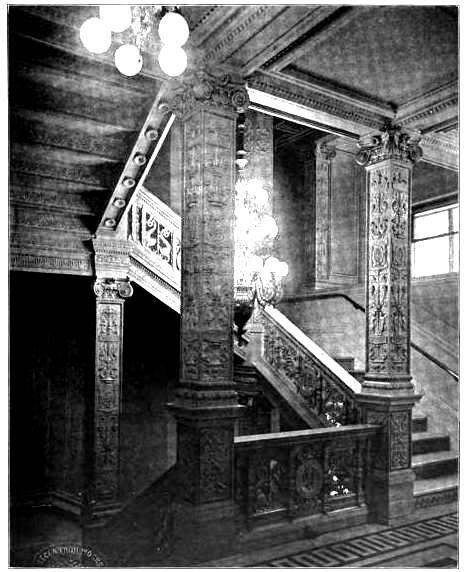 In reporting on the move The New York Times mentioned “Much of the original marble and intricately carved mahogany furniture were moved from Cedar Street to the new building. A set of delicately balanced scales once used to weigh gold dust now is displayed in a glass case.” The numerous oil paintings move to their new home included the portrait of Francis William Edmonds, chairman of the Association from 1853 to 1855. 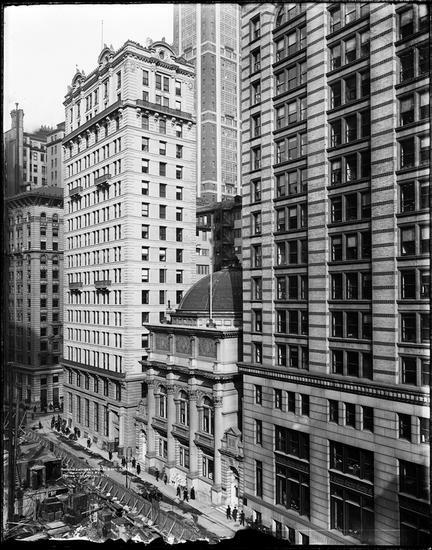 Twenty-five days after that article, The Times followed up on May 28, 1963 with the announcement that “a 40-story office building is planned at 140 Broadway in the entire square block bounded by Broadway, Liberty, Nassau and Cedar Streets.” A new skyscraper, designed by Skidmore, Owings & Merrill, was projected to cost $45 million. Almost simultaneously, plans were laid for the demolition of McKim, Mead & White’s masterful Pennsylvania Station. As Ennis pointed out, the city’s Landmarks Preservation Commission had mentioned the buildings “in its listing of notable buildings, and has recorded their history and photographed them.” Before many months it would be only photographs that survived. 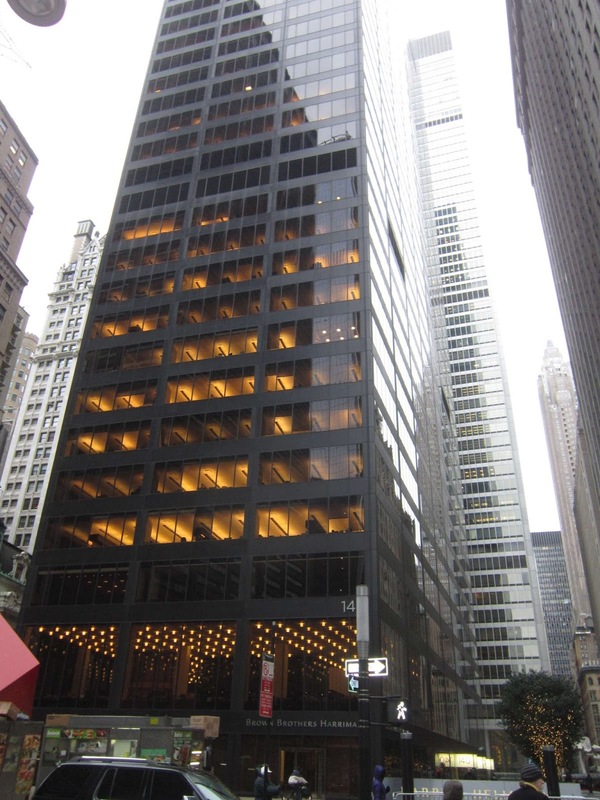 The plans for a 40-story building morphed into the 51-story Marine Midland Building, completed in 1967 and designed by Skidmore, Owings & Merrill’s Gordon Bunshaft. As a knee-jerk response (as opposed to an arm-flail response), I abhor the replacement of beautiful fin-de-ciecle architecture with what we often describe as "bland" boxes, glass boxes, or whatever offending term we want to utilize to describe our righteous disgust. The truth is, in recent years I've had a surprising reaction within myself where I often see me nodding in approval at the sight of certain post-World War II buildings, having replaced whatever masterpiece has been lost to time. The Marine Midland Building with its familiar red-orange cube was one of the things I noticed with a certain awe when visiting the city in my late teens for an extended time, around 1981. It screamed modern to me. It was of its time and full of energy and hope. It was definitely New York. I think we must be careful not to draw bland conclusions that anything modern is an abomination while anything old is irreplaceably dear. What is more upsetting than losing certain buildings is losing the history itself - the fact that great beauty and classical revival was at the forefront of our physical vocabulary, like Penn Station. In that case, greatness was replaced with horrible blandness - almost cruelty. In the case of the gorgeous Clearing House, let us at least be grateful that we know of it, even if we cannot, with the best intentions, repress the city's need to throw steel up to the sky. I like both the modern block and the now-ancient one. I only wish they had occupied different spaces. Never saw interiors before, thanks for the amazing photos, I'm sorry I love the replacement building, its so clean. I am rather like the new building too; but like James, above, I would prefer we did not have to lose a remarkable building for it. ok i completely understand and agree with you on your points. i never understood why they choice buildings were scrapped in lieu of parcels of non descript buildings that sat next door. why even go through the trouble of very expensive demolition for something that costs several times less?